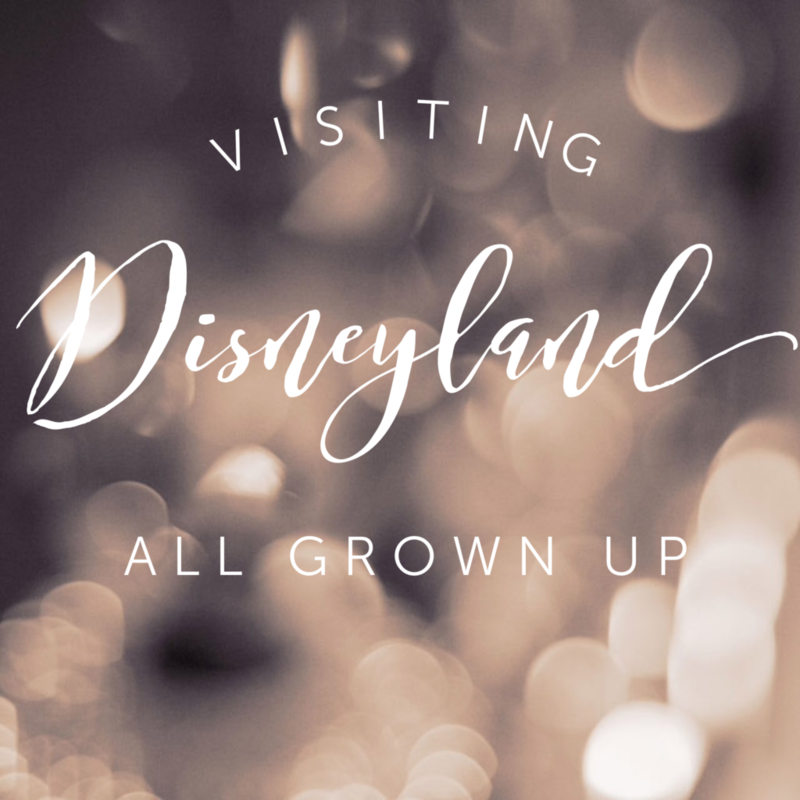 Did visiting Disneyland all grown up meet my childhood expectations? When I was little, Disneyland seemed like a magical place. To my eight year old mind it was the home of all of my favourite characters from The Little Mermaid, Beauty and the Beast, Aladdin and The Lion King, and to actually visit it would be like stepping through the cinema screen into the world of Disney, just like Mary Poppins and the Banks children stepping into the chalk paintings on the footpath and finding themselves in a world of fantasy. Now that I’m all grown up, I was worried about how different my experience of Disneyland would be compared to the idea of Disneyland that I had as a child. Would it still be exciting? Would I still have the wonder of my childhood, and the ability to accept anything at face value? Or would it all have been edged out by the rational thoughts of the adult that I’ve become? My nostalgic side had one thing in its favour – I was visiting Disneyland with my brother, the person with whom I had spent my childhood engrossed in hours of Disney movies, who had participated in the endless sing-alongs of each movie soundtrack, and who knew the importance of pretending to be a mermaid whenever we found ourselves in water. We bought a two day Park Hopper pass, which allowed us to go between Disneyland and Disneyland California Adventure Park as many times as we wanted, and both days we were at the gates when they opened at 8AM, and only finished exploring when the final parade had finished for the night, revelling in the fact that we were at Disneyland. However, when you hold on to a dream from childhood to adulthood, you develop very particular expectations around what it’s going to be like when it actually happens. Visiting Disneyland was no different. There were things that surprised me, things that I loved, and things that didn’t measure up to the experience I had imagined as a child. Being able to walk through the gates of Disneyland, to walk down Main Street USA, to ride in the spinning tea cups of the Mad Tea Party, to journey into the depths of Tortuga on the Pirates of Caribbean ride, and experience The Matterhorn and Splash Mountain for ourselves after a lifetime of reading about them in books was surreal. As we figured out our way around all of the lands, searched out the rides we most wanted to go on, and sat on the side of the path waiting for the parades and the fireworks to begin, we had to pinch ourselves to believe we were actually in Disneyland! Sleeping Beauty’s Castle, with its blue turrets rising high into the sky, was the one thing I most wanted to see at Disneyland. Not only was it the most iconic sight of Disney, being part of the production company logo that began each one of its movies, but its design has parallels with Neuschwanstein, the Bavarian castle which ignited my dream of travelling the world and starting Castlephile Travels. Rollercoasters are my favourite type of ride, and we experienced the adrenalin rush of California Screamin’, with its giant loop-the-loop, five times over the two days. HyperSpace Mountain eclipsed it though. The wait for it was long – we decided against a FastPass and found ourselves in a queue that seemed to hardly move – but once we got on the ride, it was one of my favourite experiences that we had at Disneyland. It was essentially a rollercoaster in the dark, so there was no way of telling which way you would be sent next. It was awesome and unpredictable and I loved it! It took us a while to figure out how and when to use the FastPass system at Disneyland – where you pre-book a time slot to go on one of the more popular rides, allowing you to go off and continue exploring, and then skip the majority of the queue when you show up during your time slot. Once we had worked it out, we timed it to work to our advantage, especially when going on the California Screamin’ rollercoaster at Disneyland California Adventure Park. We managed to go on the ride three times within the space of an hour using FastPasses, thanks to the kindness of a stranger who gave us their unwanted FastPasses to go on the ride again (we were helping him as much as he was helping us – you are only allowed to have one Fast Pass booked on your ticket at any one time, and he obviously wanted his to be used up as soon as possible). As I’ve grown up, I’ve become fascinated by how things work. I love watching the special features of my Disney DVDs and learning more about their story and character development process. I didn’t find much of that in the park. What I found instead was an overwhelming amount of merchandise stores lining the streets (though it was impressive that most of them stocked different items), but I wasn’t there to buy a pair of Mickey Mouse ears. I wanted to learn more about Disney and his vision for his company and theme park. That’s the grown-up in me talking, my inner child wouldn’t have cared so long as I could go on the rides and feel like I was inside a Disney movie! There were a few rides we went on which were re-tellings of the most iconic Disney movies. The one that frustrated me the most was Snow White’s Scary Adventure. The ride started off well, focusing on the terror of the Evil Queen demanding Snow White’s death. The singing of the dwarves echoed in the cavern as they mined for precious jewels, the queen cackled as she transformed herself into an ugly hag and kept tabs on Snow White via her magical mirror, and the sinister trees reached out towards us with their branches as they threatened to seize us from our ride capsule, making me squirm with trepidation. Then came the climactic scene of the dwarves stalking the queen to the top of a craggy rock. I waited to see her fall, wanting to see good triumph over evil. But suddenly, we’re passing a sign proclaiming ‘and they all lived Happily Ever After’ and being pushed out into the real world. Did the Queen tumble to her demise? Did Snow White wake up? This is never answered during the ride, and the sudden change from the darkness of the story to the brightness of the happy ending left me feeling a bit disappointed that the entire story wasn’t told. Even though I wasn’t looking to actually meet any of the characters, I assumed there would be a lot more of them around the park. On the two days we spent at Disneyland and Disneyland California Adventure Park, aside from the planned parades and shows, we spotted only Goofy, Pluto, and Cruella de Vil. Maybe we were in the wrong place at the wrong time (after all, we never looked to see if there were specific times to go and meet the characters), but in my head I had imagined we’d be running in to characters around every corner! It looked glorious docked at Frontierland. The white steam-powered Mark Twain Riverboat reminded me of the paddleboats that cruised down the Murray River at home. I dragged my brother over to it, determined to sail around the Rivers of America. After a full day of trying to pack everything that both Disneyland California Adventure Park and Disneyland had to offer, it was nice to have a moment of calm. Being ferried around on a riverboat sounded like just what we needed. We climbed on, made our way to the top deck, and then waited, looking over the lines of people waiting to go on the Pirates of the Carribbean which seemed to have increased exponentially since we last walked through there, making the small New Orleans Square even more congested. After ten minutes had passed, I turned my attention to the gangway. A trio of jazz musicians boarded, and five minutes later, they started playing. Soon the paddle steamer would leave, I kept telling myself. A man with a captain’s hat came on board, which bolstered my spirits and gave me the ammunition I needed to convince my brother that we needed to stay on the boat – our voyage was surely about to begin. We moved around the boat as we waited. Every now and then, more people would board, and then a few moments later, some others would disembark. I gazed off into the park, wondering whether we too should leave. I decided to remain resolute, and stay. In the end, our stomachs won out, and thirty minutes after we had first boarded the Mark Twain Riverboat, we left in search of food. The next day, I kept my eye on it whenever we passed through Frontierland, wondering whether it ever did leave the dock. As far as I could tell, it was always docked right where we had left it. Disneyland makes you nostalgic for your childhood. No matter how much of a big kid you are, no matter how much you give in to the wonder and the make-believe, you still feel like you are lacking something in comparison with the children who were there experiencing Disneyland during their childhood. Their enthusiasm as they lined the parade route was infectious. They excitedly waited for their favourite characters to wave to them. They were ecstatic about seeing Belle, Ariel, Elsa and Anna. That’s what I really wanted from my Disneyland experience – for the line between reality and make-believe to remain blurred, and for the feeling of being a child again.